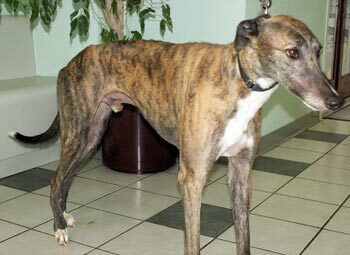 Buzz, aka Valley Buzz Bomb, is an almost 4-year-old brindle male born August 18, 2004. His sire is Always Faithful, making his grand sire the late famous Molotov, and his dam is Chasmo's Callie. Buzz's 68-race career began on August 23, 2006, at Mile High in Denver, Colorado, moving to Interstate, Pueblo, Dubuque, and Valley Race Park in Harlingen where he broke his right hock on March 9, 2008. Buzz arrived with Sunshine in Dallas on Sunday, March 16, with the help of many caring volunteers who drove both of them 10 hours from Harlingen to Dallas. Upon arrival both were taken to VCA Preston Park Animal Hospital where Dr. Jeff Ellis took x-rays to determine the extent of Buzz's injury, referring him immediately to Dallas Veterinary Surgical Center where Dr. Doug Lange performed surgery on Tuesday, March 18. Buzz's grade IV central tarsal bone fracture was stabilized with a 2mm lag screw. Buzz was in a cast for 6 weeks. His leg is now healed, and he has completed his medical procedures. Buzz is ready to find his forever home! Buzz's cat test: Buzz is cat trainable. This being his first kitty encounter, his ears shot up when he saw the cat move. He was curious, but cautious about getting close to the new creature. Then he was confused as to why the other dogs swarming around paid zero attention to the cat. Buzz decided there were other interesting things to check out and was easily distracted from the cat. He later got a cautious, up-close sniff, after which he backed off and went on about his business of exploring the house.